The publisher gave me a copy of this book at ALA Midwinter 2017. In her second comic nonfiction, "a narratoon", cartoonist Sarah Glidden (How to Understand Israel in 60 Days or Less) gives readers a behind the scenes look at the job of creating stories for news outlets. Glidden tags along with two friends, Sarah Stuteville and Alex Stonehill, reporters from the Seattle Globalist, a nonprofit journalism collective, as they travel to Turkey, Syria, and Iraq to research potential stories on the effects of the Iraq War and its impact on the war’s refugees. The idea was that Glidden would watch and listen as Sarah Stuteville and Alex gathered stories. Woven into the narrative is how difficult it is to sell these stories to big media organizations who are reluctant to pay for expensive-to-produce foreign news, especially from free-lance journalists. I spent two months with the people portrayed in this book, observing and documenting them and capturing as much as I could with my little digital recorder. I recorded our conversations as we ate our meals, walked around cities, conducted interviews, and unwound at the end of the day with a beer or three. This means what when I returned home, I had hundreds of hours of recorded conversation to transcribe and sift through. It also means that almost all the dialogue in this book is taken directly from these recording, with some minimal cleanup done for grammar or clarity. Glidden further explains that conversations were edited and condensed to make this comic readable (and not a thousand pages long). Quite a feat, but the outcome is a smooth documentation of her travels in an area that now are off limits because of conflict. Another element to this engrossing narrative is Dan O'Brien. A childhood friend of Sarah Stuteville, Dan, an X-Marine who served in the Iraq War travels with them and his reasons for returning to the Middle East makes for an compelling counterpoint to the storyline. Glidden’s drawings are rendered in soft, muted watercolors. Her writing is honest with a touch of self-effacing humor. The story of the refugees, those individuals displaced by the war, is haunting. The stories of lost family members, jobs, a whole way of life that they will never get back is heartbreaking. Many have been stuck in refugee camps for five, ten years. Waiting for asylum. For some refugees they will live anywhere, while others hate the U.S. for invading their country. The book does not shy away from some tough questions, especially how these countries changed, both good and bad, since the Iraq War. At the close of the book, before Glidden leaves to go back to Seattle, during an interview an Iraqi woman says, "I not like your government. She applied for asylum and "will go anywhere but the U.S". She says to Sarah Stuteville, "from an Iraqi to an American, she just wants to ask this one question. What is the benefit of your army coming to Iraq?" Sarah Stuteville answers, "There is none". Rolling Blackouts is a eye-opening, emotionally charged tome that everyone should make time to read. To learn more about Sarah Glidden, visit her website. 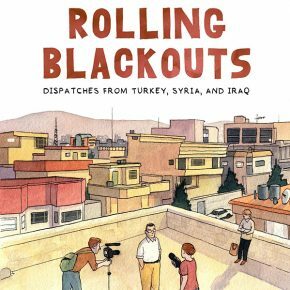 More reviews about Rolling Blackouts and Sarah Glidden: The Guardian, Public Radio International, and Rolling Stone.